It has been a busy old week with university starting up again, a quick weekend trip home (typing up this lil intro from the comfort of home’s sofa with Dad cooking me up a bacon sandwich) and a whole host of coursework and reading. Third year is definitely as busy as people say it is and this is only week one! I’m hoping next week I can be a little more on top of my shizz and not be as stressed and panicky as I was this week. Anyway, here’s my Little Things ..
TK Maxx Jacket | During our house move in the summer, I did a big wardrobe clear out and said goodbye to several pieces of well-loved clothing. Since coming back to Glasgow, I’ve noticed several holes in my wardrobe, namely a jacket for this seasonal change time of year. It is too cold to just wear a sweatshirt or cosy jumper but not cold enough for my big winter coats. TK Maxx had so many lovely styles and I’m so pleased with the navy quilted jacket I did choose as it is really similar in style to the beloved Jack Wills one I said goodbye to in the summer. It was £40 and I think the style suits me really well. 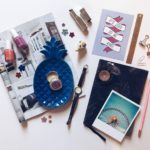 Ohh Deer Planner | I stopped my Papergang subscription over the summer as after almost a year of subscribing, I had amassed quite the collection of the stationery items. Amongst these was a gorgeous planner from the February box and I’ve been cracking it out again now that university has started again and I’m spending 95% of the time confused. 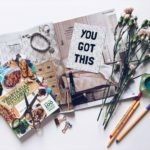 I have a mountain of reading to tackle every week for my three classes so using the planner really helps me to plan my time for reading, actual classes and my blog. This Farming Life | My flatmates are *probably* sick of me rabbiting on about this BBC1 show but I can’t quite express how much I adore it. Each episode has something in it that makes me cry. Be that be the birth of a dairy calf, Christmas on the croft with all the family, Martin’s bull winning at the Carlisle bull sales, the Udder bar at the Christmas lights switch on, Robin and Penny’s hens being let outside again after three months being kept in due to the bird flu scare. I probably shouldn’t watch it when I’m in Glasgow as it just makes me so homesick and miss the countryside 100 times more than I do already but it is just enchanting to watch. Paesano Pizza | I think most people who live in Glasgow have probably visited Paesano. It is probably the best pizza to exist and what is even more exiciting is the price. You can easily get a drink, a pizza and a pudding for under £15 which is not bad at all when dining in either the city centre or the west end. Rachel, Tori and I headed there for dinner on Sunday evening and I stepped outside of my comfort zone of the margherita pizza by going for one with salami on top. As delicious as it was, I’ll be stepping back into my comfort zone as the salami had such a kick my eyes were watering. It was such a delicious way to end the week though. Ugg Boots | Winter boots are always hard to come by but I think I’ve found the perfect pair. They are basically flat with the tiniest heel so you can walk for miles in them/won’t be unbalanced in icy conditions, are fleece lined for ultimate cosiness and are real leather so will be hardy and waterproof. At a £135 they are a little pricey but I don’t mind paying a bit more for good quality boots that I’ll get lots of wear out of. Plus I got them for £120 from Schuh with student discount. Being Busy | University can be quite boring at the times. That is my personal opinion and it might not be shared by everyone but I found the last couple of years quite empty some of the time. I like to be busy, I like to have things to do, things to work towards. Third year has really amped up the workload and although I spent a few days freaking out about it, it feels really good to have lots of things to do. It keeps me busy and stops me fretting about other things or feeling homesick. I’ve been missing home quite a lot so treating uni like a job and making it into the library early in the morning and leaving at five is giving me structure and control. Philly Pasta | I think I spied a variant of this a super long time ago on Hannah Gale’s blog (I’ve linked her recipe here) but it is one of my favourite things to cook when I’m at university. Philadelphia is such a versatile food to have in the fridge (and one of my favourites!) so I love being able to get lots of use out of it. I usually use taglitelli as my pasta of choice but in the past I’ve used conch and spaghetti. Just boil some pasta in water and then some peas, broccoli, whatever greenery and veg you have kicking around, drain the pasta but leave a little in the pan, add your Philly and some lemon juice, your cooked veg and some rocket/salad leaves and mix it all up and voila, a tasty pile of deliciousness. 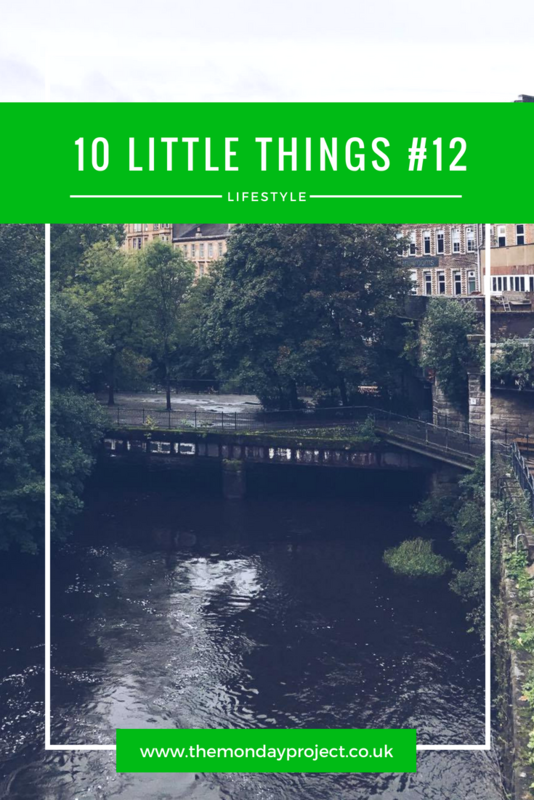 Edinburgh To Tweedbank Railway | I went home on Friday for a couple of days of relaxation and recharging (yes, I’m like done, after two weeks of uni). I love home so going home is always exciting but this Friday’s train journey was particularly lovely. It’s the second leg after coming through from Glasgow but the countryside you pass through is really quite lovely and it is very soothing and relaxing. I spent most of it writing up all of my semester one plans in my journal: all my classes, deadlines, academic meetings, blogging, home trips etc., so I’m super organised and not stressing as much as I was on Thursday when I realised I had ten million things to do. Home With A Capital H | I’ve been back at university less than two weeks and I’ve already headed home for a little while. I don’t even feel guilty about it, I adore being at home. The stillness, the greenery, the sounds, it is just perfect. I needed a moment with my mum, to think about things and make decisions in a place that I love, so going home was right. Bacon Sandwich | This might not seem mighty to a lot of people but buying bacon when I’m at uni is a bit unnecessary. As much as I would love to eat bacon sandwiches all day every day, it wouldn’t be the best health-wise so I just ease of eating it when I’m at uni unless I can get it in the reduced counter. But alas, when at home, on Saturday morning I tucked into one slathered in HP sauce for breakfast. So freakin’ good.